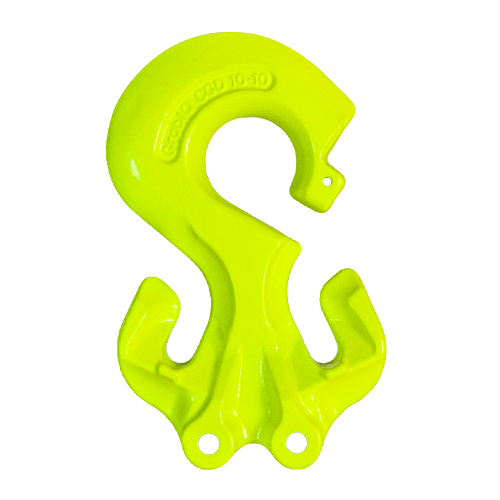 GrabiQ is an exciting new family of alloy chain sling components. Chain slings used to be built with many components, each one doing a separate job. That made chain slings heavy, bulky and expensive. With GrabiQ, a single component can perform up to three separate functions. For example, a C-Grab Dual may be used to build a double or quad-leg chain sling, using only 2 or 3 "top-of-the-sling" components. Compare this to an "old style" system, which uses up to 15 separate components! Most of the time, GrabiQ slings will be lighter than traditional chain slings because fewer components are used. And because GrabiQ fittings are made from Grade 100 alloy steel, they have a lifting capacity that is usually 25% higher than Grade 80 chain slings. To properly inspect a chain sling, you must inspect each component. That takes a lot of time, which leads to many users skipping the inspection process altogether. Because GrabiQ slings use fewer components, chain sling inspections are easier to perform, meaning they are more likely to be done on a regular basis (as legally required). * These links are meant to be used with Gunnebo's MF, MFX or MFH master links, which have an engineered flat. The "Throat Opening" specification shown for each link refers to the pinned opening toward the top of the link, which slides over the engineered flat on a properly selected master link.